The odds of you attending a ball (aka dining in) while your spouse is in the military are pretty high. I am usually someone who enjoys jeans and a t-shirt but even I enjoy getting super dressed up. After my first ball, I realized there is a lot more to it than getting dressed up. It really helps to know what actually goes on and the expectations for you as a spouse. As much as the feminist side of me cringes when I say, "You are a reflection of your spouse," it is a very true statement. I will always remember the spouse with the barely there dress or the date who got obnoxiously drunk. 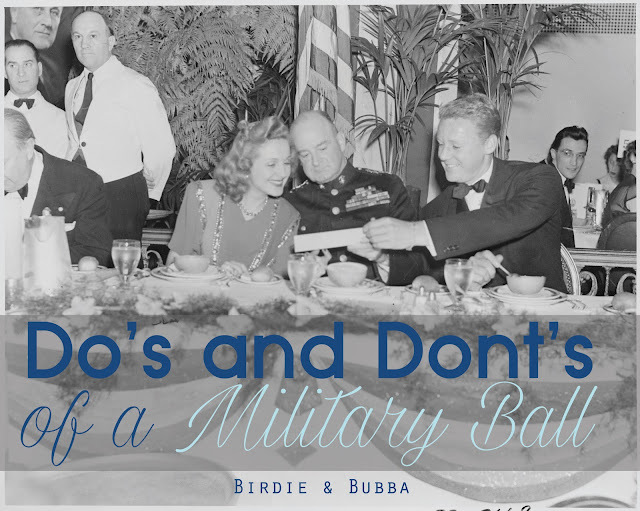 Through my own mistakes and watching other spouse's mistakes, I have compiled a list of Do's and Don'ts for your first or fiftieth military ball. If it is not appropriate for your grandmother or a pastor to see you in, then it probably isn't good for the ball. There are tons of articles on appropriate ball dress ideas so I won't go too in depth on this. Just use good judgement and leave the bandage dress at home. I have seen spouse become so intoxicated that they cannot stand up straight. Don't be that spouse. Yes there is alcohol and I love my wine but remember that your spouse's higher ups are going to be attending as well as honored guests who are usually generals. Also feel free to dance, but this isn't a nightclub so twerking and grinding are not really encouraged. When the honored guest speaker or any speaker is at the podium it is not encouraged to speak. There is nothing in my opinion more inappropriate than speaking when others have the floor. During the retiring and recieving of colors (when the flags are preseneted) you are expected to silently turn toward the flag while it is being taken to its final spot in the room. You don't have to salute or anything like that just standing quietly to show respect. The receiving line is something that looks simple enough but I somehow managed to mess up. 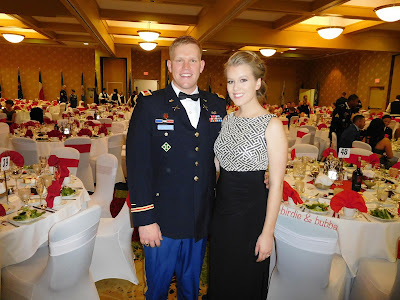 A receiving line usually includes the host and hostess of the ball (usually a general and his wife) and the honored guests of the ball (this can be a high ranking general, political figure, etc.) They usually end up having about four to five people in the line. The service members and their dates are expected to go down the receiving line, shake the hands, and introduce themselves. All you have to say is, "Hi my name is Maddy, thank you for having us," or something similar. Now here is the part that I have messed up. In every branch except the airforce, the woman is expected go before the man. I didn't do that at first. You will also see the host's aide who is at the start of the receiving line whom you will give your name. DO NOT shake their hand. I tried. They won't. You'll probably being taking a small bag or clutch but you're going to be there for a while and you'll want to make sure you have the essentials just in case. The military LOVES their traditions and many of them are created or continued at balls. They can be traditions that the entire branch takes part in or maybe just their unit. One that is most common in the Army is the Grog bowl. It is essentially jungle juice with a story. A bunch of service members bring up different alcohols or juice and poor it into this massive punch bowl. There is another soldier who reads a long funny story that incorporates a lot of drinking and a lot of laughs. The grog bowl can be nonalcoholic as well and you do not have to drink it either way. 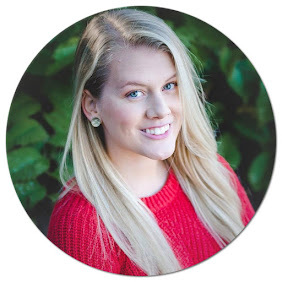 Take pictures, meet new people and spend way too much time obsessing over makeup. You will make great memories and eat subpar food.